Rhubarb crops over a long period, is completely hardy and grows in any garden soil. Its really easy to grow in full sun or part shade, and will continue to produce for ten or more years, just requiring dividing every 5 years or so. Tolerant of most soil conditions, rhubarb grows best in a neutral soil which has been dug to a depth of 60cm (2ft) or more. Incorporate as much organic matter as possible during the digging because it must last the life of the plant – rhubarb will not tolerate soil disturbance once established. The site should be prepared about 4 weeks in advance of planting to give it time to settle. Be especially careful to remove all weeds at the preparation stage – once rhubarb is planted, it will be very difficult to get rid of them. Rhubarb is normally sold in garden centres as one year old plants (known as ‘crowns’) of a particular variety.The best time to plant rhubarb is late autumn to early winter - December is a good month. If necessary, planting can continue up to the beginning of March. Buy named cultivars or choose a division from a strong, healthy-looking plant. Dig a hole a little bit wider than the plant. The depth should be such that the top of the plant is 2.5cm (1in) below the soil surface . On wetter soils planting with the buds just raised out of the soil may help prevent rotting. If planting more than one crown, space plants 1m (3ft) apart, with 1-2m (3-6ft) between rows.Fill in around the plant with soil, gently firming it down to ensure no air pockets remain. Water well if the conditions are dry. Spread a mulch (garden compost or other well-rotted organic material) around the plants, but not directly above where the crown will emerge in a month or so. 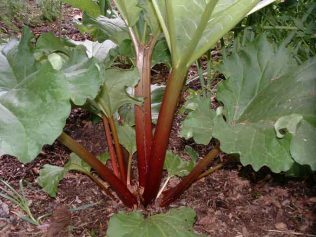 Rhubarb require very little care, but if you give them that care they will produce much finer stalks than neglected plants. A spring mulch of well rotted organic matter 7cm (2 1/2in) deep will help to retain moisture but do not bury the crowns. Plants will also respond to watering during prolonged dry periods in summer. Apply a general fertiliser such as growmore in spring or summer at 70g per sq m (2oz per square yard). Allow the foliage to die back naturally in autumn then cut away the old leaves to expose the growing points to winter cold. There is no harm in adding these leaves to the compost heap as the poisonous oxalic acid contained in them breaks down during decomposition. Once the leaves have died down, spread a new layer of garden compost or other well-rotted organic material around (but not touching the plants. This will conserve water and prevent weeds. Remove any weeds as they appear. Stems can be picked from the early cultivars from March to April. Tempting though it may be, do not pull any stems during the first season – this would seriously weaken the plant. Let the plant grow during the first year and establish a good healthy root system. During the second season, pull only a few stems, ensuring that you only pull two per plant at any one time and that five healthy stems always remain. Stems should be pulled rather than cut to prevent rotting of the remaining stump. Pull stems when they are between 23-30cm (9-12in) long, holding them at the base and pulling gently outwards. Take no more than half the total stems at any one time. The last harvest is usually in late summer, around July or August, though growth may have stopped before this if the weather is very hot. Concern is sometimes expressed over the concentrations of oxalic acid building up as the season progresses. However, this build-up is mostly in the leaves which are not eaten and the amount in the stems is not sufficient to have a toxic effect. For an early harvest of tender and pink rhubarb cover the crowns in December or January with a layer of straw or bracken and cover over with an upturned bucket or a traditional clay rhubarb pot to exclude light. Stems will be ready to pull two to three weeks earlier than uncovered crowns. Division will guarantee a plant identical to the parent and is the most common method of propagation. It is also good practice to divide established crowns about once every five years if they have become weak or overcrowded. Lift crowns between autumn and early spring (usually in November). Use a spade to divide the crown into sections each retaining a portion of the rhizome (thickened root) and at least one growing point. Sections from the outer part are better than the centres of old plants. Discard any old or decayed parts of the crown. Replant straight away or wrap in damp sacking until ready to plant. Rhubarb plants should be divided every five years or so. This will give you more plants and at the same time keep them healthy and de-congested. Some forward planning is required if you want to divide rhubarb. The best time to divide rhubarb is is when the plant is dormant, any time between December andFebruary. At this time of year the foliage will be dead and the location of the plant may be difficult to pinpoint. 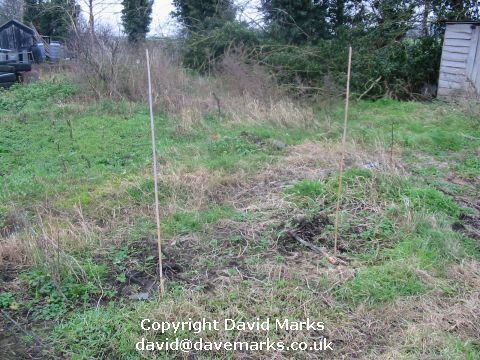 So mark where the plant is in late summer using canes, stones or whatever you have. Dig the rhubarb up by using a fork to lever the crown. If the rhubarb is 5 years or more old, this will be difficult and will cause damage to the roots under the crown but that’s not a problem. Use a spade and the pressure of your foot to divide the crown into three. Don’t be afraid, be brutal. Each third should have one or more white / pink buds on it. Most large crowns will have lots even if you can’t see them. Flowering: Some cultivars can be more prone than others. Remove flower stalks which may appear in early spring as the new rhubarb stalks emerge.Do this as soon as possible – if the flower head is left to grow and set seed, the plant will never fully recover to good strength. Flowering is usually worse after wet summers or where high nitrogen feed has been overused. Thin, weak stems: Lots of thin stems indicate the crown is losing vigour and needs to be divided (see ‘Propagation’). Increased feeding may also help. Split stems, sometimes exuding sticky sap: This is sometimes caused by late frosts but is often an indication of erratic growth due to seasonal conditions. Cool or dry periods followed by moist or mild weather means the hard outer growth splits when the new, rapid growth occurs. Mulching and feeding may help to avoid the worst damage. Green, poor quality stems: Warm, dry summers can give rise to poorly-coloured, bad-tasting stalks. Try to harvest earlier while the days are cooler and moister. Slow or no growth: Rhubarb will stop growing if the temperature rises above 32ºC (90ºF). This can happen in hot summers. Growth can also slow or stop if the plants are under drought stress so watering may help.